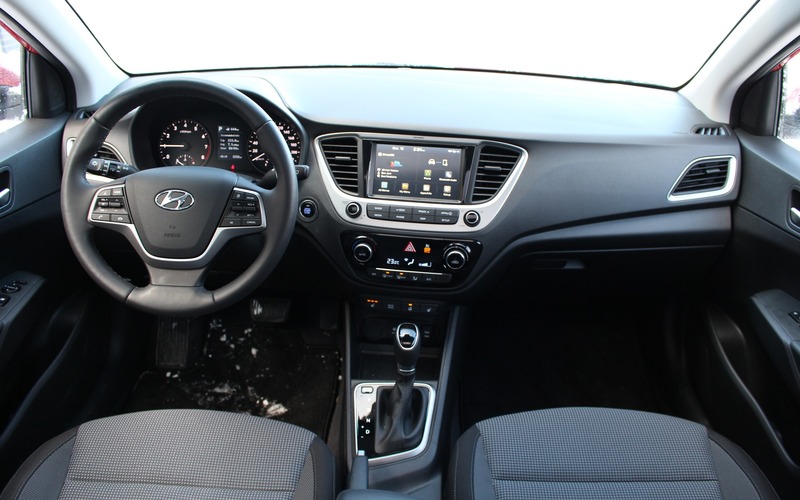 In the past few years, the Hyundai Accent attracted many Canadian customers with its affordable price—and excellent finance and lease incentives—as well as its spacious cockpit and comfortable ride. And now that it’s been redesigned for the 2018 model year, it has become more refined et quieter than ever. Still, subcompact cars face the struggle of justifying themselves on the showroom floor alongside their brand’s compact model. For a few extra bucks a month, an Elantra offers more room and is almost as fuel efficient, but the Accent still has convincing qualities. For a starting price of $14,599 before freight and delivery charges, the five-door Accent L is admittedly bare-bones. It does come with five-inch infotainment touchscreen and a USB port, but there’s no air conditioning, no heated seats and no Apple CarPlay/Android Auto integration. To get those, we have to upgrade to the LE and GL trim levels. The Accent GLS sedan we tested, however, was equipped with a seven-inch touchscreen, Bluetooth connectivity, chrome door handles, automatic climate control, a telescoping steering column, a heated steering wheel and keyless entry. All for $21,099. Unlike some of its adversaries such as the Honda Fit and the Kia Rio, which can be equipped with a navigation system and adaptive cruise control, the Accent remains low on available features. But that’s ok, because it’s assumes itself as an entry-level car. At least in regards to equipment. The Accent displays a level of refinement that we usually find in a bigger car. While the 1.6-litre four-cylinder engine is no powerhouse, its output of 130 horsepower and 119 pound-feet of torque makes the little Hyundai sufficiently energetic. Engine noise at wide-open throttle isn’t intrusive, and overall, the car makes a strong first impression. In addition, the six-speed automatic transmission works smoothly and this type of unit is a better dance partner for small-displacement engines than continuously variable gearboxes. We ended up our winter test week with an average of 7.1 L/100 km, which is quite good. We actually beat its official combined city/highway rating of 7.4 L/100 km. It’s not the most fuel-efficient subcompact car on the market, though; the Honda Fit, Nissan Versa Note, Toyota Prius c and Toyota Yaris Sedan boast slightly lower ratings. Still, the Accent is very frugal. Cockpit fit and finish is another aspect of the Hyundai that surprises. Sure, the overall design and build quality won’t put a Genesis to shame, but the switchgear feels solid, there are no glaringly obvious cheap plastics to be found, and the seat fabric is feels sturdy and upscale. The switchgear is straightforward with rotary heating and ventilation dials as well as good-sized buttons that are easy to reach while driving. Headroom is down slightly compared to the previous generation of the Accent, but otherwise, interior dimensions are about the same. Ditto for trunk space, but why isn’t there a grab handle inside the trunklid so we don’t get our hands dirty while trying to close it? 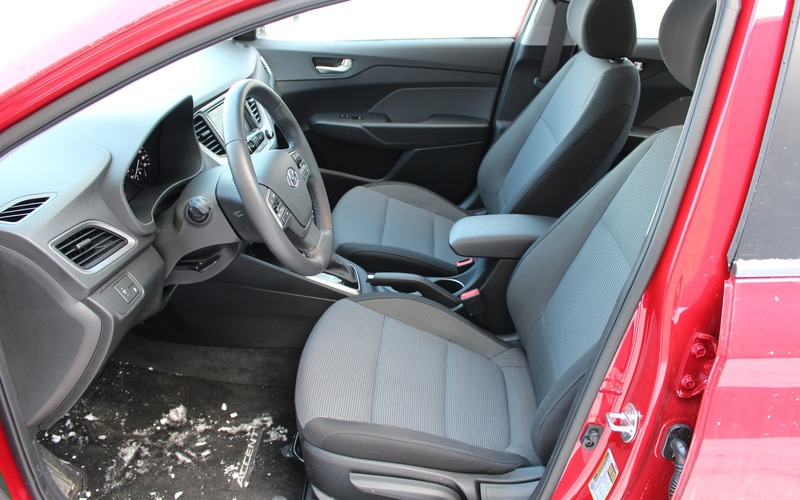 Overall, the sedan’s cockpit is a smidge roomier than in the Toyota Yaris Sedan, and almost identical than in the Kia Rio—the Accent’s cousin which shares its platform and drivetrain. 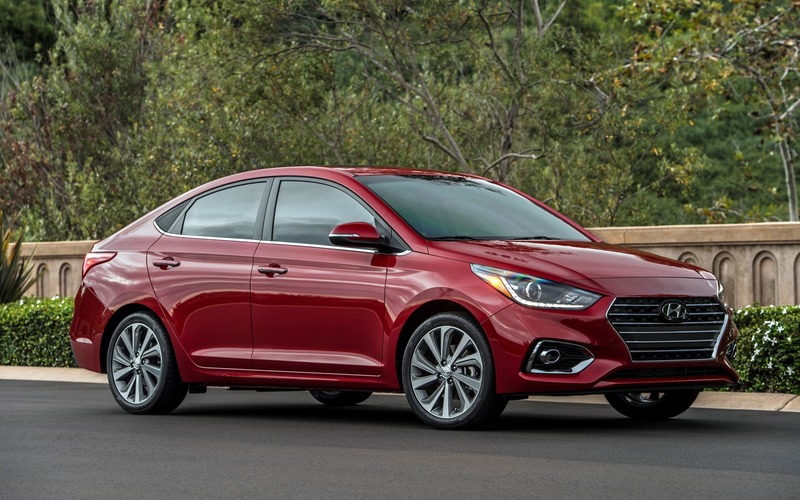 The 2018 Hyundai Accent hatchback may still have a few subcompact rivals, but with the recent retirement of the Chevrolet Sonic and the upcoming demise of the Ford Fiesta in the U.S. and Canada, competition has gotten scarce. Hyundai created a subcompact car that drives and handles like a compact. It’s refined, comfortable and fuel-efficient, and comes well equipped for the asking price. But as we said above, the biggest obstacle is convincing buyers that it’s just as good as an Elantra, but for less money. 8/10	Not the best among subcompacts, but very good nonetheless. 7/10	Good front seats, a little tight on legroom for rear-seat passengers. 7/10	The 1.6-litre engine has enough power and torque to get the Accent moving along swiftly. 8/10	Easy to use, with a good-sized touchscreen—at least in the GLS trim. 6/10	It’s a no-frills subcompact car, so we shouldn’t expect a thrilling ride. 8/10	A great subcompact car, plain and simple.